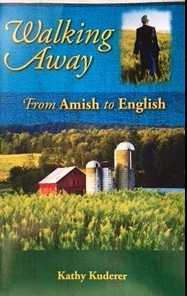 “Walking Away” is a heartwarming and tear jerking collection of true stories about the lives of young men and women who have left their Amish upbringing to seek out the world that most of us take for granted. A world where electricity, telephones, hot running water and motor driven vehicles are part of our everyday life. When the Old Order Amish leave their way of life it is often not only a way of life that they are leaving, but also their Amish families and friends. It is the practice of Shunning that will cut them off from the only life they have known. Author Kathy Kuderer has shared stories of those that have left that life, and also the stories of Mothers and Fathers, Brothers and Sisters, Grandparents and Friends who have been left behind. You will be transported into another world, feeling the joys and sorrows of many individuals and their families. Kathy has worked with the Amish for over 20 years and is very knowledgeable about their way of life. She has come to know many ExAmish as well and is privileged to share their stories with you. This book is available for $16.99 plus tax and shipping. Contact Kathy at downacountryroad@yahoo.com to place your order today. Book is available at The Village Shops at Down A Country Road.